I have been supplying and installing artificial grass in England for over 14 years. During this time I have seen the general quality of artificial grass products improve significantly. What I have also noticed is that the general knowledge of artificial grass installation has not improved by the same margin. This is most noticeable if you are looking at buying your artificial grass from third party retail outlets. Who am I referring to when I say third party retail outlets? This is garden centres, builder merchants, DIY stores (large and small), carpet companies and even some artificial grass companies. Five or six years ago I had stands made up which contained samples of my artificial grass products. These stands were placed in a number of retail outlets to help sell my products. The problem I had was I was not able to train each and every shop assistant on my products. The customer service levels were therefore very poor as the shop assistants knew nothing about the product and how to install it. More importantly they couldn’t advise on the overall cost of supplying and installing the grass properly. What you have to realise is I purchase my products directly from my chosen EU manufacturer. It has taken me years to find a manufacturer I am happy with. Because I buy large amounts of grass from them I can buy at a good price and pass this on to you the customer. However, retail outlets generally buy from someone that has purchased it from the manufacturer. So by the time it hits the shelf you will also be paying the garden centre, DIY store etc their mark up percentage. So effectively you have paid three different companies by the time you get your product home. More importantly you haven’t received any valuable advise in the process. 1. Buy directly from a company like mine and you will get good sound advice based on years of experience as well as getting your grass at a good price. To do this simply organise a time to come in and see us at our depot and we will talk you through the options explaining the different products. 2. We can also explain to you how to fit the grass yourself or arrange for us to do it for you. 3. You can buy artificial grass in any amount 10 sqm plus which we will cut off the roll and get ready for you. 4. You may have an unusual area where you are looking to lay artificial grass. Again we can advise you on how best to lay it. 5. We can give you advise and offer additional items you hadn’t thought of like foam underlay or artificial grass cleaner. 6. You can either take the grass with you there and then or we can arrange for delivery. So next time you are walking through a large DIY store looking at their range of artificial grass consider how much margin they are adding to the grass and will the product they are trying to sell you be the best one for your needs. Or will the product they are trying to sell you be giving the salesperson the biggest profit margin? Had my artificial grass fitted by Perfect Grass Ltd they were professional in every way. They cleaned up after every day they were here. Can not thank them enough for a great job they did. Will be recommending then to anyone who asks. From start to finish Gavin and his team were First Class. 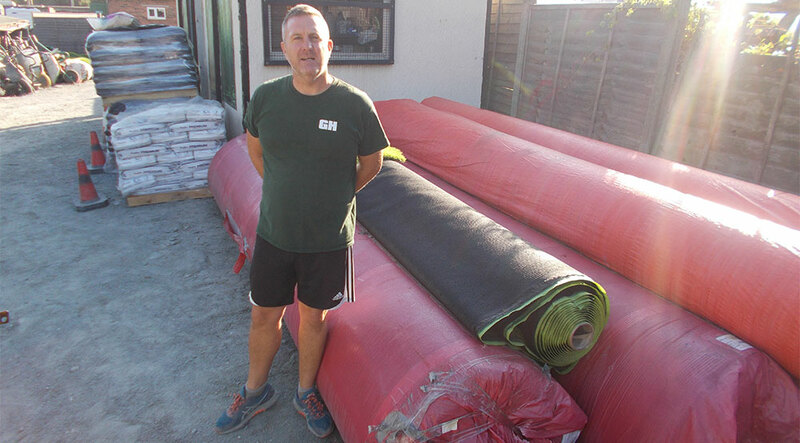 I had not a clue about artificial grass and Gavin put my mind at rest not only about the laying but also the price. I can not praise them enough other than I have already recommended Perfect Grass Ltd to a friend who also wants help and assistance. Just a shame about the football team he supports!